Sydney Payne will graduate from Anclote High School in Holiday, Fla., this June. St. Leo University in nearby Dade City has accepted the Advanced Placement student to begin classes this fall, which would make her the first in her family to attend college. She works part-time at an ice cream parlor in Tarpon Springs, but Payne needs financial support to make her college dream a reality. While Payne has been going to school, working, volunteering and serving as historian of her school’s Interact Club – as well as pursuing her Certified Nursing Assistant (CNA) and Certified Medical Administrative Assistant (CMAA) licenses – Aileen Carlson was searching for a deserving local candidate for Watermark for Kids. 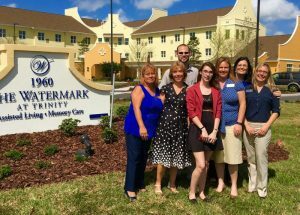 Carlson is Executive Director of The Watermark at Trinity, a new assisted living and memory care community in Pasco County’s Trinity suburb opening in April. Watermark for Kids is a national nonprofit associated with Watermark Retirement Communities, which manages 38 communities throughout the U.S, including their latest, The Watermark at Trinity. Carol Ciadella, Payne’s former teacher at Gulfside Elementary School in Holiday, recommended Payne to receive support from Watermark for Kids. The nonprofit is committed to empowering underserved kids from ages 6 through 22 to express their character, leadership, creativity, compassion and spirit. On Tuesday March 15th, Watermark for Kids awarded Payne with a new pair of prescription eyeglasses, a $300 Target gift card, and funds to cover her car insurance for six months and her books this fall. Payne, who has volunteered more than 250 hours as a teacher’s assistant in Ciadella’s classroom, wants to be an elementary school teacher after finishing college. Since 2011, Watermark for Kids has honored nine other kids in the greater Tampa Bay area in partnership with The Watermark at Trinity’s sister properties The Fountains at Boca Ciega Bay in St. Petersburg and The Fountains at Lake Pointe Woods in Sarasota. Awards ranged from art, music and dance lessons to funds to cover books and supplies for college.